“Choose from over a million apps and games on Google Play to install and use on your Chromebook,” says a screenshot shared to reddit over the weekend. Think about that for a second. All of the Android apps you have been running on your phones and tablets for years, now running on Google’s other desktop-like operating system that has always been a tough sell to many of us because of its lack of functionality. Would you be interested in a Chromebook if it ran all of your favorite apps? Google hasn’t announced this functionality, but it does make a lot of sense. In recent months (years? ), rumors of Chrome OS and Android merging have been everywhere, even if they are so different in terms of focus that I don’t know how much sense a merge like that really makes. 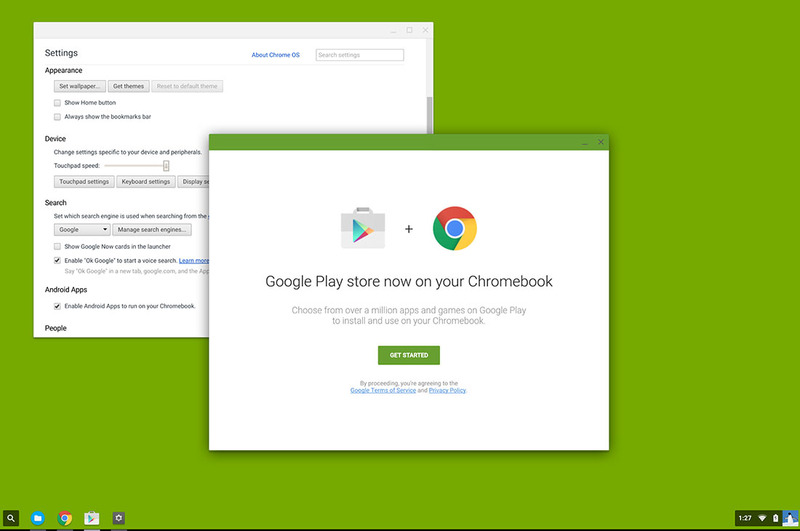 But this move, Android apps running on Chrome OS the way it is, makes a hell of a lot of sense, at least to me. Instead of merging Chrome OS and Android and just having a single platform, you could keep the dead-simple browser-focused experience of Chrome OS that makes it good, but then allow users to introduce additional functionality through a real app ecosystem, not just an extension catalog. Your favorite photo editors from Android could come over (like LightRoom!). So could your favorite Twitter apps and package trackers and controllers for your LED lights and reddit apps, of course. The image at the top of this list post is showing up on a handful of devices, but users are claiming that nothing is live yet or there isn’t a way to access Google Play just yet. There are source code mentions for it too. It’s clearly, a thing. Oh, and Google I/O arrives in less than a month, so we could/should/likely will know something very, very soon. What do you think? Would you be interested in a Chromebook if it ran Android apps?